If a tough, dent-resistant, transport option is preferable, the RTI Outdoor Carrying Case may be right for you. Made with a rugged, high impact polypropylene exterior, this case is water proof and can take a beating. Inside, it has many of the same design features as the Piranha Premium Case. 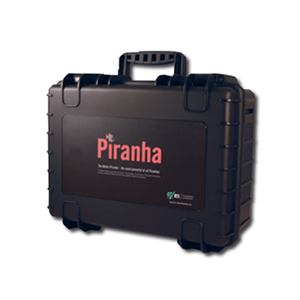 The Piranha and any desired accessories are stored in two convenient and compact layers. Your investment is safe and ready for use the next time you walk into an X-ray room.